Quickly secure patients to backboards and other devices with the Ferno Fastrap. 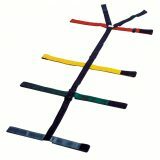 This 10-point, six-strap system is sequentially color-coded (black, red, yellow, green and gray) and features nylon webbing with hook-and-loop closures at the ends of the straps for fast, easy application. Size is adjustable from adult to pediatric. Compatible with Ferno Millennia and NAJO series backboards, and with Ferno scoop stretchers.